This article is the "border finale" of Mystery Quilt #3 - free Fat Quarter Mystery Quilt. Have you made a quilt top (whether our Mystery #3 or not) and you aren't sure what to do for a border? Here is a way to make a border easily that will relate to your quilt top if you have pieces of fabric left from the body of the quilt. If you made the Mystery Quilt #3 you'll have two sizes of pieces left over - either 6" x 9" (if you cut from a standard quarter yard) or 4" x 18" (if you cut from fat quarters). I'll show these proportions in the illustrations below - BUT you may, of course, use any size scraps you have on hand. Calculate how much border you will need by adding up the lengths of the 4 sides of your quilt top plus add approximately 18" extra to allow for the borders increasing the length and width. Write this length down so you can refer to it later. I'm assuming you'll want to cut a 3-3.5 inch border width (which will sew up 1/2 inch less after the two seam allowances are subtracted. Note: If you sew a border that is pretty wild and scrappy you may want to first surround the finished quilt top, before adding the border, with a contrasting 1-1.5 inch border to separate the scrap border from the quilt top. Experiment with some strips of various colors to decide. I'll be placing a lot of images on this page - if all don't load, hit the Refresh or Reload button on your browser to see them. 1. 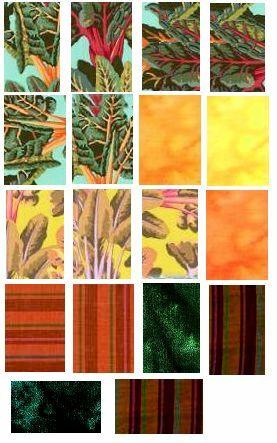 If you have pieces that are rectangular, approximately 6" x 9" they may look something like these in the illustration above which are examples of scraps that might be left over from some of the sample fabrics I showed in "fabrics ideas " page for the Mystery Quilt #3. For the shorter pieces arrange them in a sequence you like and sew a long strip as shown at the left. You may want to make some sections narrower by cutting them in half to vary the width. Notice, for example, that with the yellow piece in the 3rd position from the top and the red-orange stripe a little further down are cut narrower. If your pieces are not all the same length, make sure that you line up one edge on the same side of the strip for all pieces, so that only one edge is uneven and you have minimum waste. Press your seams as you go along - I recommend pressing them open rather than to one side for a smooth border seam later. You should be able to cut two strips of 3-3.5" each across the width from one long assembled strip. If you can cut 3 strips, all the better. You will then sew the ends of these strips together to make a long border unit. When you cut this piece into narrower width(s) for the border the fabrics will be even more scrappy looking with a result something like the strip shown at the right. Here are two of many possible approaches to arrangements for longer, narrow strips. 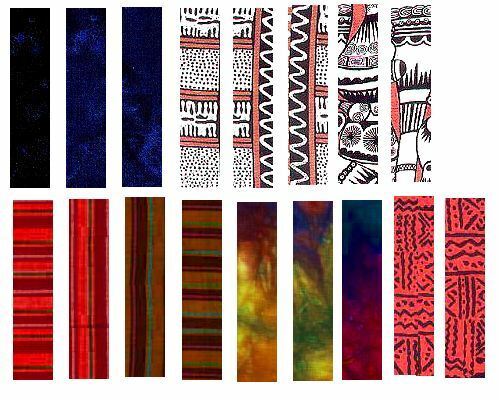 The left grouping shows many strips sewn randomly using many fabrics. The right grouping shows how effective a more limited fabric selection can be for more contrast. Notice also that the right strip demonstrates that sometimes putting two pieces of the same fabric next to each other to make a wider stripe and using some narrower widths of the dark fabric makes a more interesting arrangement. If you use fewer fabrics, be sure to vary the widths to give more variety to the resulting cut strips. Again, after sewing, press all seams open. After cutting, the two assembled fabrics above will yield narrow strips of 3-3.5 inches with the look below. Here you can see a narrow version cut from the above pair of strips. It's surprising how different a narrow cut of a strip pieced fabric will look compared to the full width. But, don't be in too much of a hurry to cut your assembled fabric into these long strips. On the next page I'll show you an alternative to cutting long strips from this fabric for a very different look to a scrap border. To be notified when I add articles to this site, Sign up for the Free emailed newsletter from Equilters.com. It's a short emailed newsletter to let you know when new articles and links are added. I promise I will share your email address with no one!